Gold has reached a new price per ounce and the gold rush is on again. It can pay off in both recreation and funds to search for gold, but you do need to invest in gold mining supplies. 1. If you are planning to pan for gold you need a medium size pan of about ten to thirteen inches in diameter. Plastic or metal can be used, but most miners prefer a metal type with a smooth finish. 2. You will need a small shovel with a short handle as well as miner’s picks, gravel lifters and crevice breakers or picks. You will also need sand lifters and a magnetic metal detector pick is a good investment. 3. You must have a classifier or a screening tool you can place on top of a five gallon bucket. Shovel your gravel on this classifier. 4. 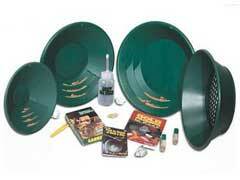 Gold mining supplies need to include a snuffer bottle to “snuff” up small gold flakes. 5. Metal detectors are a miner’s best friend and the best gold detectors will be determined by your needs, experience level, what you hope to find and the amount you want to spend. 6. Gold prospecting equipment also needs to include a highbanker which is similar to a sluice box on a four-legged stand. It provides the sluice box with the correct slope and can be used to pump water directly from the stream bed. This box is great if you do not want to kneel by the river or stream with your sluice box. 7. Also consider a drywasher that do not require water to work. Drywashers are tremendous for mining in desert areas where there is no water. 8. A gold sluice is usually a narrow box that when placed in a steam or river allows war to pass through and separates the dirt and rock from the gold. Gold is heavy and will stay on the bottom of the sluice for ease of collection. 9. Additional gold mining supplies that a prospector may want to use is a gold dredge or a placer mining machine that extracts golf from gravel and sand using water and mechanics. Small suction machines can be purchased by individuals for gold dredging, but dredges are usually used by commercial mining concerns and leave environmental disaster in their wake. 10. Additional gold mining supplies need to include leather gloves, good boots, and the proper equipment for working outside in all types of weather.